Untap the potential of your group. 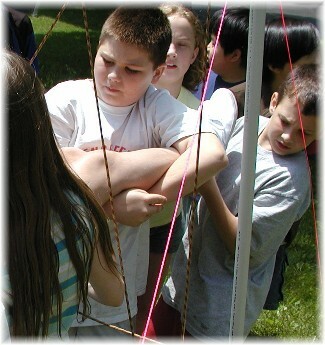 Start with a series of icebreakers and progress to more challenging activities such as Spider Web and Nuclear Waste. This four hour program is great for a team that will be together for a length of time, like a classroom or summer staff. The progress of a cohesive team is directly related to the time invested in its development. This 6 hour program is designed to build a foundation of trust between its members. 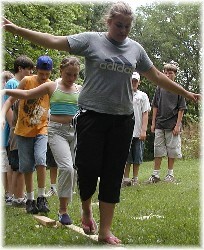 The day will include goal setting activities and various challenging events. Indoor Summits offers team building programs that consist of activities that explore elements of the mental, emotional and physical realm. We understand the value of a challenge and encourage participants to excel to and beyond their comfort zones. Indoor Summits joins forces with numerous organizations including park districts, day camps, troops, and schools. We have specifically created programs that are ideal for students in grades five through 12. Our goal at Indoor Summits is to explore team building through dynamic experiences. Experience an incredible group formation process and create a total adventure for your group when you invest in the an all-inclusive adventure program. Start with a 1/4-day session of team building initiatives, follow up with day of local adventure challenge activities at Indoor Summits and complete it with an adventure trip to Devils Lake for a weekend of climbing, teambuilding and more. This program may be customized to meet your needs with various adventure activities. Possible activities include, kayaking, spelunking, climbing and more. Great for an introduction to team development. This 2 hour program will break the ice for  new groups, expose the potential for future group success, and get the members laughing with just enough challenge to make it fun. *Ideal for day camps. Group growth is essential in running any successful organization. Dont let your team stagnate and become unmotivated. At Indoor Summits we customize our adult programs to create a team-building session based around your goals. We will specialize the activities to meet your needs. Whether you wish to build trust amongst team members, enhance problem solving skills as leaders, hone group decision making skills or just break the ice and have fun, we can create a program just for you. We also support a Challenge by Choice environment. And your groups over-all safety during activities is our number one priority. Why wait? Begin enhancing your groups dynamics today. 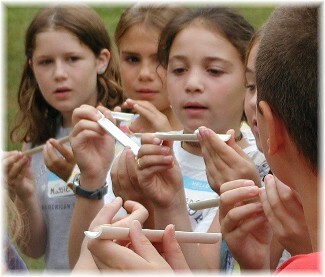 Have you always wanted to use cooperative games within your curriculum? Have you longed to learn the attention catching activities to get your students excited about learning? 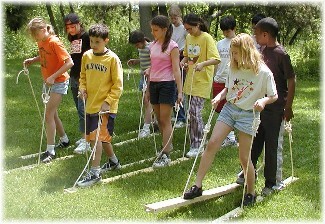 Benefit from Have you wished you had the appropriate props and equipment to facilitate a successful team building activitiy session with your class? Or better yet, knew how to make the props for minimal cost and materials? Indoor Summits will teach you the basics in this workshop. Registration includes props and materials you will take home with you to get started.